Garden ponds, vleis, forests and deserts – frogs are found in practically every environmental niche, adapted to survive in these widely different habitats. Vincent Carruthers has vividly photographed 116 species of bullfrogs, cacos, chirping frogs, golden-backed frogs, dwarf leaf-folding and leaf-folding frogs, ghost frogs, grass frogs, Hogsback frog, kassinas, kloof, marsh, micro and ornate frogs, platannas, puddle frogs, rain frogs, rattling frog, reed frogs, river frogs, rubber frogs, sand frogs, shovel-nosed frogs, squeakers, stream frogs, toads and tree frogs. 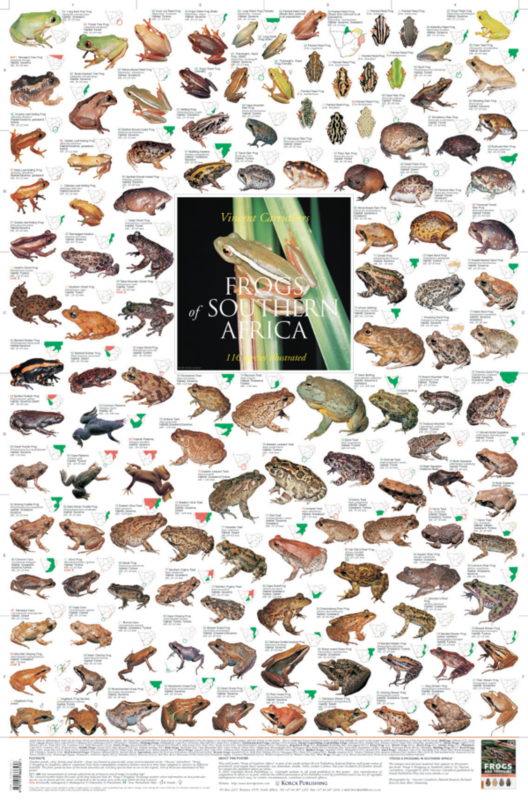 All of these are to be found on the Korck Publishing wall poster “Frogs of Southern Africa”. Navigate the poster with ease with the quick-locater poster referencing system incorporated on all of the New Format Korck Publishing wall posters.